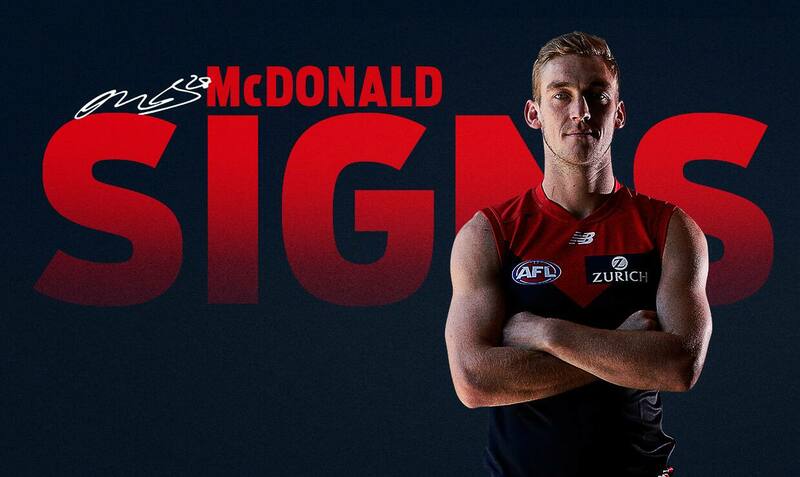 DEFENDER Oscar McDonald has signed a new deal with the club, keeping him in the red and blue until at least the end of 2020. General manager of football operations Josh Mahoney said the club was pleased with McDonald’s progression. “Oscar is a young developing defender who has taken on a lot of responsibility within our defence,” he told Melbourne Media. McDonald, the younger brother of Tom, has played 23 matches this season for a total of 60 AFL games. He has developed into an integral part of Melbourne’s side, and a mainstay in the team’s backline. McDonald made his AFL debut in round 22, 2015 against Fremantle at Subiaco, which also happened to be Nathan Jones’ 200th AFL game. The 22-year-old has played the past 40 matches in a row for Melbourne and his form in recent weeks has been another reason for the team’s rise. Originally drafted at No.53 in the 2014 NAB AFL Draft – coincidentally the same draft number as Tom in 2010 – he was drafted from Edenhope-Apsley/North Ballarat. McDonald received a NAB AFL Rising Star nomination in 2016.